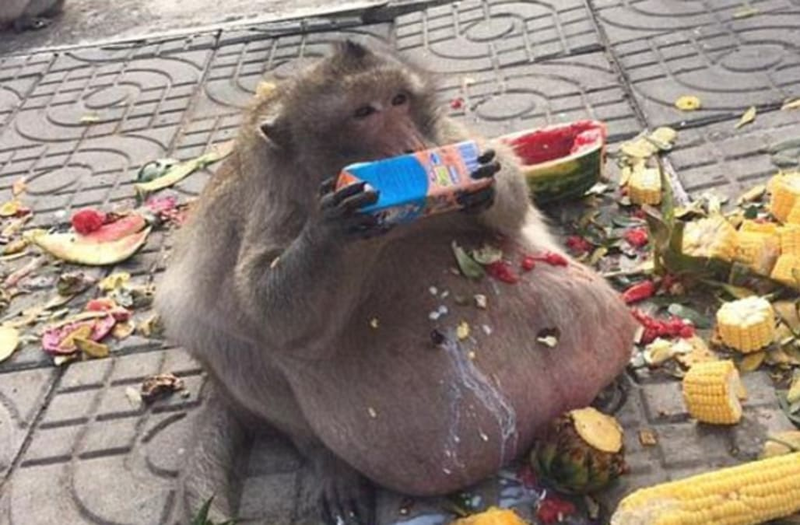 A morbidly obese monkey known as Uncle Fat has become royalty in his Thai community. The creature, who weighs a startling 60 pounds, gained three times the average body weight of his breed by eating junk food left behind by tourists, according to the AP. He has been rescued from his own indulgence and limited to eating 400 grams of lean protein, fruits and vegetables twice a day, according to Supakarn Kaewchot, the veterinarian in charge of his care. Uncle Fat's caretakers hope to get him to a healthy weight soon so his risk for obesity-related diseases decreases. The New York Post reports that the monkey was not only a tourist darling -- he had minions who would bring food back to him. Sometimes, he would redistribute it among the younger monkeys like a chunky-but-fair-king.